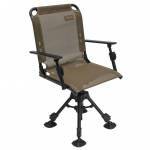 Steel frame construction Weather resistant seat Seat Height Adjusts 17" to 24" Swivels 360* Foot Rest EZ Chair weighs 16lbs Holds up to 300lbs ..
Total comfort seating while hunting inside a blind. 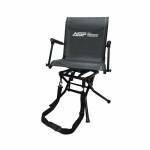 The GelCore Mesh chair includes GelCore Technology, which allows the chair cushion to become more comfortable the longer you sit by eliminating pressure points for ALL DAY comfort. Gel helps with temperature regulation – keeping warm in low temperatures and cool in high temperatures. The GelCore Mesh chair relies on threaded height adjustment. Unlike hydraulic height adjusted, threaded adjustment will not be affected by extreme temperatures. 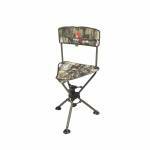 We..
Plano Field Box Hunting Stool. 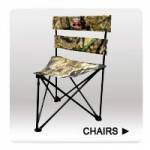 Features an integral seat cushion and storage pockets for all your gear. 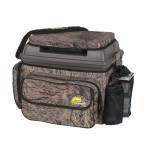 1812 Field box with tray Large gusseted storage pocket Side gusseted storage pocket Side mesh pockets and mesh back pocket Carry strap Exterior: 18" x 15" x 13" .. 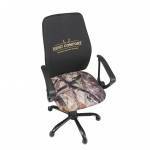 The Stealth Hunter Deluxe, a luxury spin-off of the popular Stealth Hunter, offers all of the original features of the Stealth Hunter with the addition of removable and adjustable arm rests. We all know waiting for the perfect shot can take time. 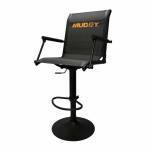 The sturdy and comfortable 360-degree rotating blind chair will give you that maximum comfort while you wait for action, and when the time is right the arm rests can give you the support you need for a steady shot. Blind hunting can't get much better. 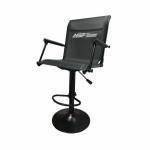 T..
Flex-Tek Zero-Gravity seating for added comfort Swivels 360 degrees Seat height adjusts 17" to 24" Solid steel frame Footrest and armrests included ..